real order that is struggling to exist and to be served. If I were a member of any discrete group – such as might be identified by the kinds of racial, ethnic, religious, lifestyle, or cultural uniqueness that would provide a target for violence from others – I would become the most vocally insistent advocate of the principle of privately owned property. It has become axiomatic, in our politically-structured and dominated world, that only by relating ourselves to some collective grouping large enough to be able to influence the political system to our advantage, can we find protection from arbitrary violence. Such groupings cannot be so large as to prevent our separation from others (e.g., “mankind”), for politics depends upon division among people, setting up inter-group conflicts that politicians and other state officials promise to “balance” in the interests of social order. We have been conditioned to accept as an article of faith that “in unity there is strength.” Carl Jung, among others, has helped us to discover just how vulnerable our lives become when we identify with such abstractions. When we transfer the direction and responsibility for our lives to others – particularly to the institutions that are eager to have such powers – we fuel the madness and destructiveness that dominates our world. As Nietzsche so well expressed it: “Insanity in individuals is something rare – but in groups, parties, nations, and epochs it is the rule.” History teaches us – provided we are willing to learn from it – that in “unity” we are made vulnerable to attack from others. Empowering others with the authority to centralize decision-making and obedience over us creates a jugular vein that makes us susceptible to collective aggression. It has long been assumed – particularly among persons conditioned in the political mindset – that individual liberty and social order are conflicting values that can be harmonized only by a willingness of people to submit to governmental rule. I have spent decades reading and contemplating the works of philosophers of both authoritarian and libertarian persuasion and find a general – albeit not universal – sentiment supportive of the idea that “some” individual liberties must be restrained in the more widely-shared interests of an orderly society. I have long rejected this view, intuiting that it is the nature of living things to freely act in furtherance of their respective self-interests. Any restraint on such liberty struck me as being contrary not to some political ideology or constitutional principles, but to the requirements of life itself. I was also aware, as my studies of human history continued to advise me, that the self-interests of a few could be promoted by subjecting the many to coerced restraints upon the pursuits of their interests. It was through the creation of such agencies as the state that institutional interests saw the self-serving advantages inherent in the coercive nature of political systems. This led to the structuring of the lives, behavior, and property of others. But apart from my subjective “I-don’t-like-that” response, is there any principled objection one could make that would effectively demolish the theoretical foundations upon which political systems depend? This was the question that gnawed at my mind and soul throughout law school: why should I have to justify my desire for liberty on any grounds other than the fact that I do not choose to be coerced? Why need I appeal to any principle beyond that of my own will? 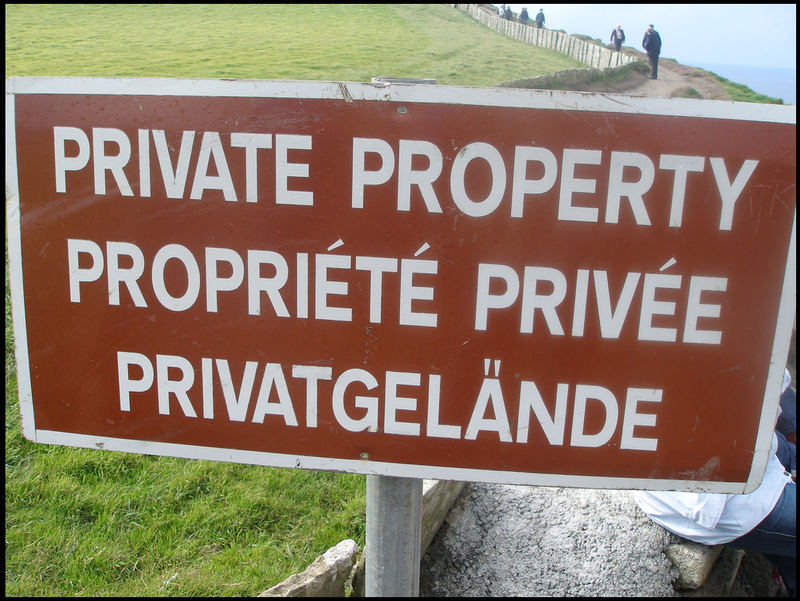 With the paradigm-shifting importance of the works of Robert LeFevre, I soon discovered the role that “private property” plays in providing an answer to my inquiries. The property principle is not about “things” or “space,” but about our relationships with one another concerning things and space. It is a concept that had no meaning to Robinson Crusoe until he discovered the presence of Friday on the island. In that instant, the fundamental property question arose: who gets to make decisions about what? This is where “property” as a social system comes into play. Without another “person” – a potential “owner” of some of the “things” and “space” to be employed in the pursuit of his or her interests – Crusoe can rightfully take whatever actions he wants on his island. He has complete liberty in this regard. But when another person is introduced, Crusoe still enjoys complete liberty as to what he owns. The question becomes one of working out who it is that owns what. Precisely the point of the example. As the owner of the brick, I may do whatever I want with it that is consistent with my ownership interests. I can throw it through my window, hit myself over my head with it, or use it to help build a wall. My complete liberty encompasses everything that I own, but my decision-making ends at the boundary line of what is mine. If I want to throw my brick through your window, I must obtain your consent – via contract – as the window’s owner. As long as we respect the property principle – which respects the inviolability of owners – both unrestricted liberty and social order will prevail. At this point I usually hear the plea: “but property rights are not absolute,” an empty cliché that glosses over the fundamental character of all property: whatever legal and political system being considered, somebody will have the ultimate authority to make a final decision as to any item of property. Be it a commissar directing what crops can be planted on a given parcel of land, or the owner of a house deciding whether to tear it down or convert it into condominiums, or the EPA preventing a lumber company from cutting its timber, someone’s authority will be absolute; not subject to being overturned by another. It is the nature of fascist political systems to bifurcate the purported ownership of property from its control. Such division generates the conflict that has been destroying America. It has been our politically-driven separation from one another into allegedly irreconcilable interests that has plagued mankind. Franz Oppenheimer identified the two principal ways in which wealth can be acquired: (1) the economic means, in which people can freely exchange claims to property for their mutual advantage, or (2) the political means, in which the coercive powers of the state can be employed by some to loot the wealth of others. The brick/window hypothetical is lost on most “bottom-line” minds that see no immediate benefits to respecting the philosophic principles that simultaneously maximize individual liberty and societal order. Such persons regard adherence to principled living as a cost to be borne by others. While fashioning themselves as being driven by “pragmatism,” they fail to see how the attraction of increasing numbers of people to such thinking ends up producing the most impractical consequences to an entire economy. I return to the inquiry with which I began this article: why would anyone who saw themselves as members of any distinct minority ever want to empower the state to regulate human behavior, even when there might be some short-term benefit to be gained? How near-sighted are those who call upon the state to prevent others from exercising the liberty to act as they choose with what they own? When racial, ethnic, gender/lifestyle, or religious minorities ask the state to compel others to employ, do business with, rent or sell housing, or otherwise cease discriminating against them in their decision-making, don’t they understand that they are creating a precedent for such powers to be directed against them? If I can get the state to force others to use their property as I choose, why would I not expect such coercion to one day be employed against me? Neither the gay couple nor the judge understood that the principle upon which the baker was relying is the same principle that will keep anti-gay bigots from burning a cross on their lawn. The judge’s arrogance in assuming the power to determine where one person’s rights end and another’s begin is a decision that is easily resolved by respecting the property principle. But then, political systems have always been at war with the concept of privately-owned property. Every activity of governments is grounded in disrespect for private property claims. Whether considering powers of eminent domain, zoning, taxation, building codes, drug usage, gun ownership, immigration, product standards, NSA surveillance, wars, employment practices, or any other state-policies, the liberty of individuals to control their own lives and property is at stake. Those who smugly defend these state practices hide behind such empty slogans as “equality” and “diversity.” But the enjoyment of “equal rights” finds consistency only within the property principle, a point the poet e.e. cummings acknowledged in stating that “equality is what does not exist among equals.” George Orwell – along with the Colorado Human Rights Commission – informed us that, while all of us are “equal,” “some are more equal than others.” Those who are “more equal than others” include the special interest beneficiaries of “diversity” policies, designed to ensure that members of politically-certified groups receive preferences in hiring, promotion, admissions, etc. Butler Shaffer teaches at the Southwestern University School of Law. He is the author of the newly-released In Restraint of Trade: The Business Campaign Against Competition, 1918–1938, Calculated Chaos: Institutional Threats to Peace and Human Survival, and Boundaries of Order. His latest book is The Wizards of Ozymandias. This entry was posted in Education, Natural Law and tagged authority, control, Franz Oppenheimer, liberty, owner, principle, private property, rights by cnlib. Bookmark the permalink.